Teachers are some of the most influential people in the world. They encourage and inspire young people to believe in themselves and to strive for the best. That’s why Tyrone Bates is proud to play a role in bringing high quality educators to the Kansas City, Kansas Public Schools. As an alternative certification specialist for the district, Bates oversees a number of programs that seek to recruit and retain the best of the best in the education field. A certified teacher himself, he knows what it takes to manage a classroom and to open students’ minds to learning. But teaching wasn’t something he always aspired toward. Growing up in the KCK Public Schools, he credits athletics for saving his life. In fact, he’s writing a book about it today. Athletics taught him to be determined, resilient and steadfast. It helped him set goals and reach high levels of achievement. Most importantly, it got him into college. Out of high school, Bates received a scholarship to run cross-country and track at Northwest Missouri State University. After a few years, realizing he was not an Olympic runner, he set his sights on a field that would allow him to influence others and one that would allow him hands-on time with his own family: teaching. Today he has a bachelor’s degree in biology and chemistry and a master’s degree in curriculum and instruction. 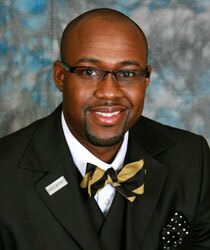 He is currently working toward his doctorate in educational leadership and policy analysis. He was part of the second cohort of the original Kansas City Teaching Fellows Program, which brings professionals to the district for classroom training while earning their certification to teach. His goal today is to be an example for young people everywhere, and to be a positive role model for young men who don’t have a male presence in their lives.